Thomas Crowley tackles psychological thriller, Oscar touted success story Black Swan. Black Swan is the 5th film by acclaimed director Darren Aronofsky and stars Natalie Portman (Brothers, Closer) with support from Mila Kunis (That 70’s Show, Forgetting Sarah Marshall), Vincent Cassel (La Haine, Oceans 13), Barbara Hershey (Hannah and Her Sisters, Falling Down) and Winona Ryder (Edwards Scissorhands, Girl, Interrupted). The film revolves around the production of the famous Tchaikovsky ballet Swan Lake by a New York ballet company. Portman plays Nina Sayers the protagonist of the production who is terrorised by the psychological difficultly, emotional strain and physical demands of playing the role of both the White Swan and the Black Swan. After the success of 2008’s The Wrestler it may seem like Aronofsky has taken on a completely different project to his last film. On the contrary, The Wrestler and Black Swan have a lot in common, both thematically and in quality. Aronofsky explains ‘Wrestling some consider the lowest form of art- if they would even call it art- and ballet some people consider the highest art. But what was amazing to me was how similar the performers in both of these worlds are. They both make incredible use of their bodies to express themselves.’ (source: filmonic.com). It is hard to describe a film like Black Swan. The psychological aspects may lead it to be described as a Psychology Thriller or even Psychological Horror. However, to simplify it down to a particular genre does not do this complex and fascinatingly intense film any justice. Black Swan is proof that one should never judge a book by this cover. Admittedly I probably would never have gone to see this film if I hadn’t known it was directed by Aronofsky. A film about ballet, who wants to see that? Brilliant direction and captivating acting on the part of Natalie Portman (who recently won the Best Actress Golden Globe for her part) ensure that this film is a triumph as Aronosfky goes about depicting the brutal…yes brutal, world of ballet. 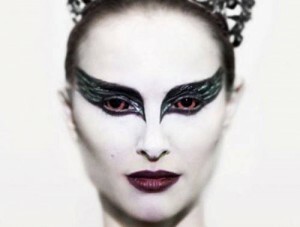 Portman is brilliant as the ballerina who is emotionally and psychologically torn apart as she tries to find her inner dark side, her Black Swan. Lily (Kunis) is the friendly antagonist who attempts to steal her role from her. Nina is the perfect fit for the White Swan, beautiful, fearful, and innocent. Lily is the Black Swan personified, daring, seductive and free. Thomas Leroy, played by the smooth and suave Vincent Cassel, is the ballets director who attempts to play the two characters against each other for the benefit of his production. Elements of intersexuality and Freudian psychology cannot be ignored. The idea that there is good and evil in everyone is a strong theme in both Tchaikovsky’s Swan Lake and Aronofsky’s Black Swan. Nina is sexually repressed and has an over-bearing mother (Hershey). She must break free from these personal obstacles if she is to give the ‘perfect’ performance. Aronofsky often depicts Nina’s psychological instability as manifesting itself physically, which suggests a Cronenberg influence coming into his work. The sheer intensity of the films score, which was based on Tchaikovsky’s original composition for Swan Lake, will have you on the edge of your seat; it is relentless for the final half an hour of the film. I strongly recommend going to see this film. It is without doubt one of the best film’s I have seen in a long time. It is hard to find anything negative to say about it. The film opens with a dream and you’ll feel like you haven’t come out of one until the screen fades to white and the final credits show up.